A professional installer may own their own company or they may work for a company that they don’t own, but always be wary if you hire a “professional” installer and they have no company affiliation at all. Even self-employed professional installers usually have an affiliation with a company and if they don’t, you can still validate their experience with a little online research! Even if your professional installer has a company affiliation, it also doesn’t mean that they’re as professional as they should be to get your job done correctly. One way that you can know more about the installer that you are thinking about hiring is to look them up online. The information that you find online will tell you a lot about the skill, the demeanor, and the overall experience that other clients have had with the installer in the past. Of course, not every review is going to be a glowing five-star review, but if you notice that the installer you are considering has nothing but complaints and negative reviews…well, it’s time to forget their name! You want to hire someone who has happy clients in their wake, not someone who has disappointed clients time and again. This point is about safety as much as it is about ensuring that you hire a professional installer to complete your installation job. Letting anyone you don’t know into your home is worrisome and any professional installer understands that trepidation which is why we carry proper identification with us at all times. If the installation expert that you hire shows up without any identification or if they refuse to show you their identification before you open up your home to them, then there’s a chance that they aren’t who they say they are. At Suncoast Installs, all of our professional installers have identification and will be happy to show that identification when asked. If you hire another professional installation technician and they show up and refuse to show their identification, do not let them into your home before calling the company they work for to confirm that they are who they say they are. If the company cannot confirm who they are or if you just feel uncomfortable with the situation, you can ask them to leave or call the local authorities. You shouldn’t ever have to worry about your safety when you call a professional service to your home! Just like identification, every professional installation expert should show up to a job with the tools that they need for the job. 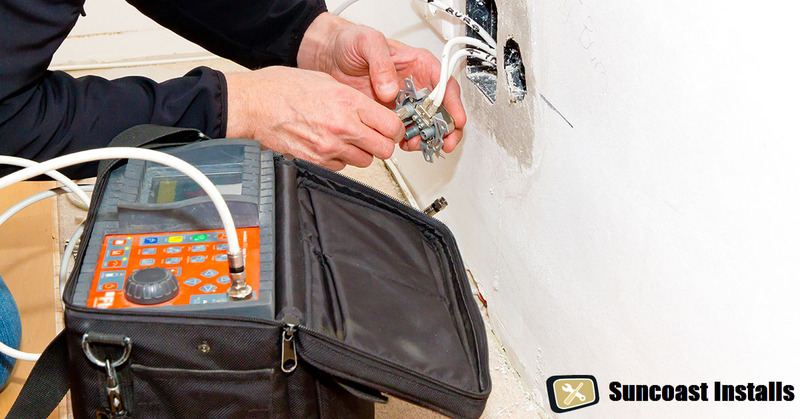 Of course, sometimes unexpected complications will arise that require a tool that the technician may not have on hand, but if a professional installer shows up at your home and they don’t have half of the tools that they need for the job – including the basics – we recommend asking them to leave and canceling the installation job. You may feel “rude” doing this, but keep in mind that you have a lot at risk if you hire an installer who is not experienced or fully trained to do their job. An inexperienced technician installing your new television can’t only damage or destroy your new television, but they could also cause a fire in your home and put you and your family in danger! It sounds obvious, but if your installer shows up to your home and a) don’t know what job they are there to do, b) don’t have any idea where to begin with the job that they’re there to do or c) repeatedly have to call someone for help with questions about the job, there’s a pretty good chance that they have no idea what they are doing and that they shouldn’t be trusted with the job. There is more to being a professional installer than carrying a license, a professional should act professionally as well! If you call or visit an installation company and they show no interest in your business, they are rude to you, or they treat you disrespectfully, know that you ALWAYS have the opportunity to walk away. At Suncoast Installs, we believe that when you pay for a professional service, you should get professional service and that’s what you’ll get from our technicians EVERY time you call! In Need of a True Professional Installer? If you’re in need of a true professional installer and you live in West Florida, Suncoast Installs can help! Just pick up the phone and give us a call at 727-480-8358 and let us know how we can help you with your upcoming installation. No matter what it is that you need to be installed, we can take care of it for you! Previous PostDunedin Installation Services Can Save You Time and Money!